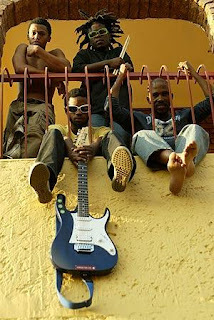 BLK JKS – South Africa’s answer to Bad Brains – have been touring the U.S.A. in recent months... gigging with the likes of Spearhead, Santigold and Femi Kuti. On July 5 (this coming Sunday) the band will be at Brooklyn’s Weeksville Heritage Center. I would love to see these cats live. But since I missed them in L.A. back in May, I’ll settle for a FREE MP3. Click here to hear “Molalatladi” on my Vox blog. To download the track, follow this link to RCRD LBL. WTF. I missed them? This is what happens when you work too much. That line-up sounds like fire! I feel in love with this group when you featured it on this blog. I hadn't heard of them until you posted their performance at SXSW, but now I'm on their nuts.